“Superfood’ is a word that gets thrown around a lot these days. When dieticians or doctors use the word, they usually refer to specific types of food that are not only healthy and nutritious, but can aid in the prevention of disease and can strengthen the body in in other ways. Beans most definitely fall under that definition of superfood, so we thought what better company to give our famous beans than a gathering of other superfoods in one wholesome and tasty superfood salad. The superfood company our classic beans keep in this salad include tasty tuna, fresh green kale and spinach, and light nutrient-packed scallions. Backed by chard, celery, carrots and a slew of spices, this is a salad hearty enough to be a full meal. On a leafy bed of power greens, this is the ultimate in healthy, energy-laden lunch food that’s perfect at home, work or school, or even at a picnic. The classic flavors in this power salad are created by combining shredded carrots and diced celery with tuna and pinto beans. The dressing consists of fresh thyme, dried marjoram and oregano in olive oil with lemon juice. The salad is completed by placing the mixture on top of the power greens. Try this salad as a lunch dish sure to fuel the rest of your day or main dish for a busy weeknight dinner. 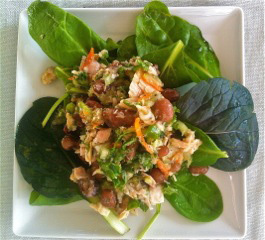 Combine the pinto beans, tuna, celery, carrot, kale, and scallions in a bowl. In a separate small bowl, combine the thyme, marjoram, oregano and lemon juice. Slowly whisk in the olive oil to create a dressing. Season with salt and pepper to taste. Gently fold in the dressing to the pinto bean and tuna mixture. Serve over power greens. Can’t get enough of crisp, tasty salads? Download a free copy of the Randall Cookbook Spring Salads and keep your healthy lifestyle going strong! Are you hungry yet? Head out to the store, and look for Randall’s Pinto Beans to make this dish tonight.